SAE Detroit Section student chapters are invited to attend the annual Student Chapter Kickoff Event. 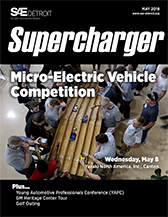 This is a great opportunity to meet other SAE student members, professionals in the automotive industry, and share their SAE projects and events. The social hour will begin at 5:00 p.m. with dinner starting promptly at 5:30 p.m., followed by presentations. The deadline to register is Wednesday, September 13. SAE Detroit Section student activities will be discussed and each chapter will have the opportunity to present an informal five-minute presentation on their SAE accomplishments and upcoming activities. There will also be a speed networking opportunity for students to engage with professional engineers from various companies in the automotive industry. If you are an engineer interested in participating, please email Roxanne Loeffler or call (248) 324-4445 ext. 3. Important note: If your chapter has not submitted the 2017 Fleuelling Fund, please be sure to do this as soon as possible. This is free money that students can use towards their SAE projects and events. For more information, visit the Lewis E. Fleuelling Memorial Student Fund webpage.